Mentha or mint has a long association with Ayurveda and the other entire Alternative and complementary healing methodologies. With its sattvic (power to enhance purity and harmony) and prana (life force or vital energy) enhancing properties, Mentha and its essential oil is trusted to heal a range of health conditions including depression, anxiety, nervous tension, lack of self-esteem, asthma, rheumatism, bronchial congestion, lack of appetite, fever, rheumatic conditions, halitosis, dandruff, acne, flatulence, bad breath and the list never ends. The essential oil of Mentha has antidepressant, stimulant, carminative, antiseptic, cholagogue, expectorant, antispasmodic, antiphlogistic, antioxidant, stomachic, antimicrobial, nervine, antifungal, analgesic, detoxifying, anti-pruritic, diaphoretic and anti-flatulent properties. The major chemical constituent of Mentha essential oil is menthol and the other components that make Menthol oil as worthy as its weight in gold are a-pinene, b-pinene, flavonoids, menthone, methyl acetate, limonene, b-caryophyllene and camphene. Mentha is a plant genus in the family of mints known as Lamiaceae. There are about 20 species of plants and hybrid mint varieties in the Mentha genus. The most popular among them are Peppermint, Spearmint, Japanese Peppermint, Banana mint, Penny royal, Garden mint, Apple mint, Orange mint, Water mint, Wild mint, Forest mint and Asian mint. Mentha arvensis, Mentha piperita, Mentha spicata are the most famous botanical (species) names of the Mentha family. Most often, all the members of this family share common chemical constituents and the corresponding remedial properties mainly due to the qualities acquired from the same genus Mentha (It’s parent). Mint is the most friendly and quickly growing perennial plant and its origin has been referred to Asia and Europe. The history of ancient medicine has a handful of remedial references on Mentha and its varied significance. The genus name Mentha has said to be obtained from Greek mythology, where Menthe, a nymph who was transmuted to a plant by Proserpine as a result of his jealousy on the love of Pluto for Menthe. Aha! Moment again and the credit goes to you ladies, as again like most of the tremendous plant varieties, Mint is also a female indeed!! “It is comfortable for the head and memory, and a decoction when used as a gargle, cures the mouth and gums, when sore. Garden Mint is most useful to wash children’s heads when the latter are inclined to sores, and Wild Mint, mixed with vinegar is an excellent wash to get rid of scurf. Rose leaves and mint, heated and applied outwardly cause rest and sleep”, says Nicholas Culpepper, the 17th century herbalist and physician. Mint is a universal herbal remedy for various health problems, where the traditional Romans and Greeks used these miraculous leaves for treating indigestion, colic, pain and respiratory illnesses. The primordial Europeans used Mint leaves for dealing with gall bladder disorders, flatulence, cough and other digestive mayhems. As a nourishing appetizer, Mint has been used in various mouth-watering dishes across the world including the cuisines of India, Asian subcontinent; Middle East, America and Britain. Mentha leaves have been used in making traditional tea varieties in India, where mint tea is said to alleviate fatigue, anxiety and instill instant nourishment to the brain. Many research studies conclude that Mentha is a trusted remedy for irritable bowel syndrome. The essential oil of Mentha has been used in the manufacturing of various things including soaps, dandruff shampoos, acne creams, skin care lotions, jellies, teas, candies, syrups, ice creams and beverages. Mentha is also a noted flavoring ingredient in toothpaste, mouthwash, chewing gums, perfumes, cosmetics, pain balms and vaporizing ointments. 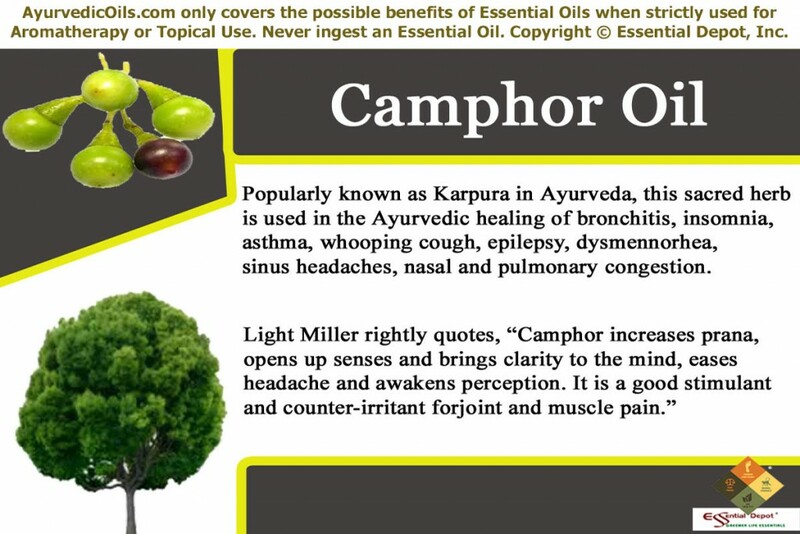 What is your thought about Ayurveda? What do you really think? Is your mind uttering that it is an ancient science, a traditional healing system, works slowly, needs patience during the healing tenure and at last you soothe stating that you don’t have much time to take up an Ayurvedic treatment. Is Ayurveda still the “Road not taken” in your life? Then listen to me, you are not too far from attaining a healthy and harmonious life. More than just a medicinal system, Ayurveda is a complete and disciplined way of living. The word ‘Ayur + Veda’ simply means the knowledge of life. All it needs to take up Ayurveda in your life is to do a thorough self-examination, for understanding your individual constitution (the innate rhythm of your system with nature) contributing to your physical set up, psychological attributes, spiritual element and your behavioral patterns. You can take the help of an Ayurvedic expert to learn about your doshas and then frame your way of living that strikes absolute balance with nature. Ayurveda recommends Dinacharya or Ayurvedic routine, things to follow in your day-to-day living for prevention of illnesses and increased life span. The rich historical reference of Ayurveda vests with India for about 5,000 years, where it is believed to be a gift of the Lord of Creation (Brahma) to the Lord of Medicine (Dhanvantari). This sacred science of healing was taken to the next level by the Ayurvedic philosophers Acharya Charaka and Acharya Sushruta, the masterminds behind the Ayurvedic encyclopedias Charaka Samhita and Sushruta Samhita. According to Ayurveda, every individual is unique with a distinct individual constitution, likewise their health conditions should also be treated in a unique manner even if it is for the treatment of the same sickness. The first Ayurvedic consultation with your Ayurvedic practitioner helps you to identify your medical history, Prakriti (unique individual constitution – combination of 3 doshas) and the most suitable treatment methodologies exclusively for your physical, emotional and spiritual conditions. Ayurvedic essential oils (prana or the life force of plants), herbal medications (fresh, dried herbs or herbal infusions), yoga, simple physical exercises, meditation, prayers, Ayurvedic routine, Abhyanga (Ayurvedic massaging), and Pranayama (balanced breathing), Panchakarma (detoxification techniques) are the major Ayurvedic remedies prescribed often. These medications aim at balancing the doshic irregularities due to changes in lifestyle, code of conduct, food habits, weather and work conditions. Ayurveda recommends the use of Mentha and its essential oil for aggravating vata dosha and pacifying pitta and kapha energies. Pitta dosha is combination of fire and water. This dosha is responsible for metabolic functions, body temperature and cognitive abilities. Pitta dosha is often associated with the stimulation of Agni or the digestive fire. Pitta vitiation ends up in excessive secretion of gastric juices, digestive acids and other digestive enzymes, which in turn rest on the stomach or intestinal lining. This ends up in gastric ulcer, irritation of the bowel and intestines. Mentha is known for its potent to pacify pitta or the digestive fire with its cooling and soothing effects. It is for this reason; Mentha and its essential oil are used for treating irritable patterns in the intestines and bowels. Michael T. Murray, Naturopath and the known author of “The Encyclopedia of healing foods” says that Mentha oil calm down the muscles and walls of the stomach and intestines, which aids in alleviating indigestion, abdominal cramps and pain associated with irritation and irregular bowel movements. The stimulating, refreshing and energizing aroma of Mentha oil makes it an effective remedy in controlling vomiting (for which it is called as vatihari in Ayurveda, means one that prevents vomiting), bloating and nausea especially during travel. Wearing 2 drops of Mentha oil to your hankie or a tissue and inhaling the uplifting aroma while travelling can pacify the digestive system and protect you from the inconveniences of puking on the go. A 2010 study published in the “Digestive diseases and sciences” journal has concluded that Mint oil considerably lessened pain in the abdomen and enhanced the lives of people suffering from irritable bowel syndrome. Massaging your abdomen with 4 drops of Mentha oil, 2 drops of Marjoram oil and 2 ounces of coconut oil can assist in relieving flatulence, bloating, motion sickness, belching, heartburn, abdominal spasms and peristalsis with its stimulant, carminative, antispasmodic, stomachic and anti-flatulent properties. 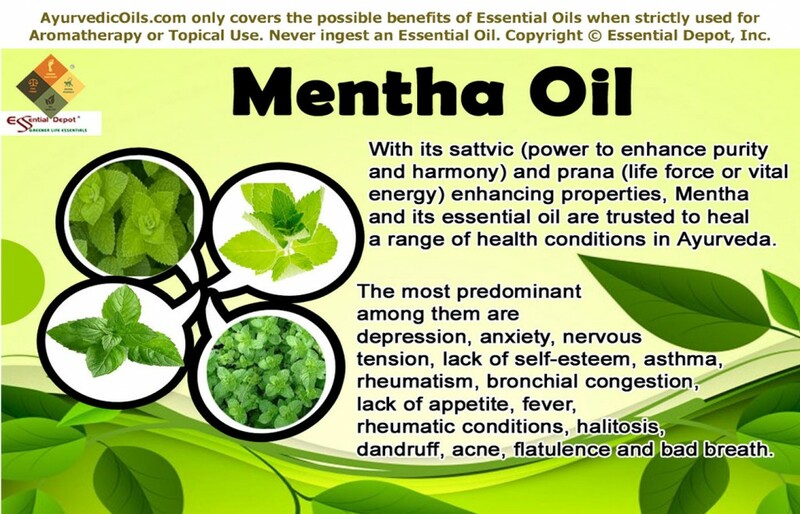 Mentha is absolutely one among the top 10 essential oils for its ability to discard all forms of stagnation in the system including lungs, stomach, gall bladder, kidneys, lymphatic tissues and blood. According to Ayurveda, stagnation or retention of fluids, toxic remains, salt, uric acid, and fat deposits invite numerous foreign bodies and the corresponding disorders by deteriorating the functions of the system. Fluid retention is a kapha disorder and is the key to rheumatic conditions, edema, joint pain, obesity, low level of insulin resistance, fibroids, increased blood pressure and heart problems. With its power to reduce kapha imbalance, Mentha oil assists in treating pain, inflammation and flushing out excess fluids and toxic remains in the system. 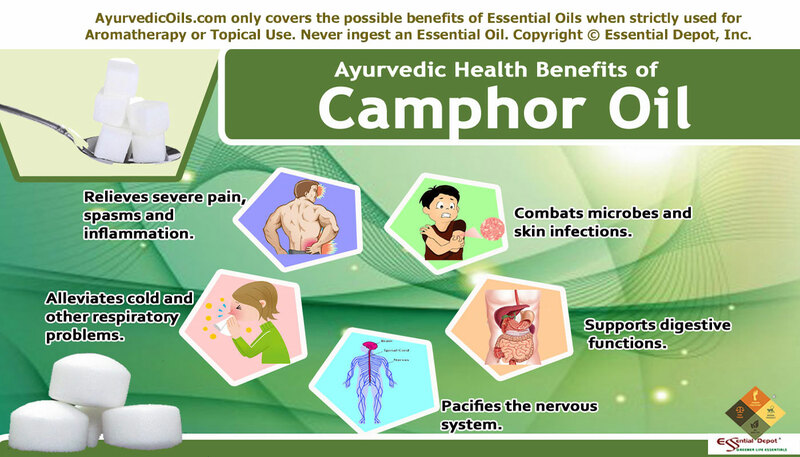 These remedial benefits are attributed to its anti-inflammatory, analgesic and diaphoretic properties. A gentle massage with 5 drops of Mentha oil, 3 drops of Ginger oil with 4 ounce of Evening primrose oil can assist in reducing pain by causing numbness in the aching area, eliminating toxic remains and surplus fluids by promoting frequent sweat and urination and soothing the tensed muscles and nerves. Stress, depression, anger, fear of failure, feelings of loneliness and other mental worries eats up your intellect and your power to fight back and triumph. Mentha essential oil has an extraordinarily soothing, invigorating, heartening and reviving aroma that grants you the perfect power of resisting your mental maladies, encouraging your power to rise up, augmenting your intellectual abilities, clearing the mental blocks, calming your nerves and your entire system from within. Throat chakra or Visukthi (genuineness and the power to communicate bravely). Solar plexus chakra or Manipuragam (self-esteem and self-confidence). Sacral chakra or Svathishtanam (pleasure, abundance and well-being). Root chakra or Moolatharam (power of survival). Adding 2 drops of Mentha oil, 1drop of Vetiver oil and 1 drop of Patchouli oil in your vaporizer, burner or diffuser especially during Pranayama, meditation and prayers can grant in opening, relaxing, clearing and activating all the associated chakras or the points of subtle energy. This rewards the power of overcoming loneliness, negative emotions and helps in exhibiting the supremacy of being a self-confident, legitimate, intellectual, cool-headed, fearless and productive person. This also helps in enhancing your concentration power, treat memory loss and vent out your hatred feelings and jealousy. 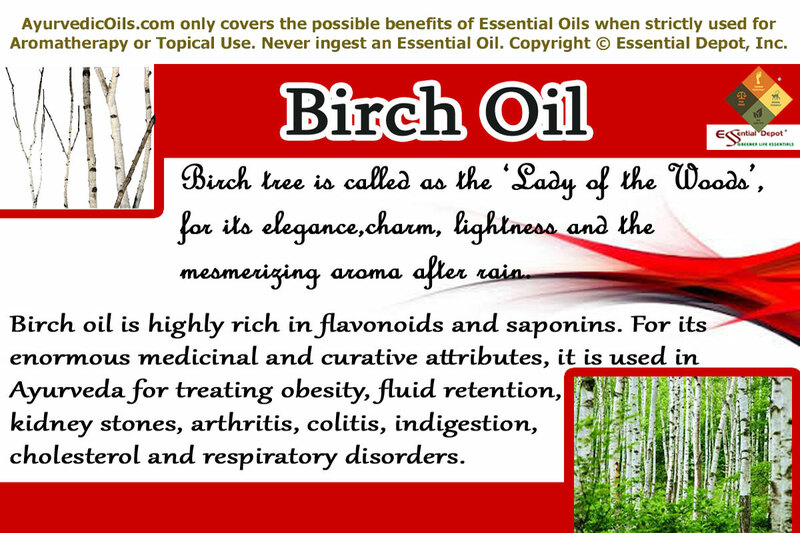 You can also add this blend in your bath or in your aromatic candles before bedtime. Bad breath or halitosis is not just a symbol of poor oral hygiene. Instead, the common underlying causes are poor digestion and retention of ama or toxic remains in the body. Mentha essential oil has disinfectant, antimicrobial, cooling, energizing and refreshing attributes that helps in killing germs and microbes responsible for oral problems like gingivitis, cavities, mouth ulcers and bad breath. Mixing 2 drops of Mentha oil and 1 drop of Lemon oil in a cup of warm water for gargling, preferably twice (morning and night) in a day after brushing can help in healing mouth sores and bleeding gums. It also assists in refreshing the breath and treat cavities, gingivitis (gum inflammation) etc. Trouble-free breathing is a gift to mankind as the healing powers and the life force or prana of Mother Nature enter the system through breathing in and toxins in the system are purged through breathing out. 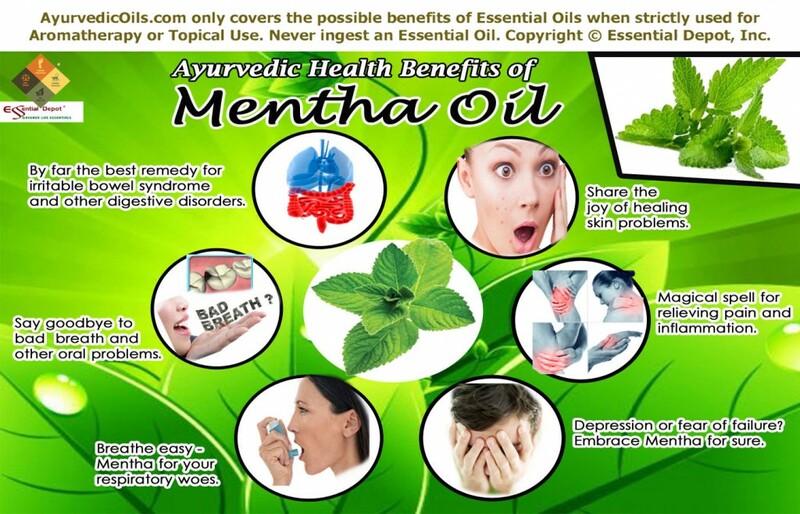 The essential oil of Mentha has excellent decongestant (attributed to the presence of menthol), expectorant and stimulant properties that help in treating asthma and other breathing difficulties caused due to respiratory conditions. Steam inhalation with 2 drops of Mentha oil and 2 drops of Eucalyptus oil followed by a gentle massage with this blend added to your mild vaporizing cream can help in opening up blocked nasal and bronchial passages, clearing congestion by loosening the phlegm and mucous deposits, relieving headache associated with sinusitis and migraine and in relieving fever, runny nose, itchy eyes and other associated symptoms of cold. Pimples???? No more panics as Mentha promises in clearing excess oil, sebum, dirt and other harmful microbes in the sebaceous glands. It controls the secretion of sebum and allows the skin to nurture from within. Skin impurities are again a symbol of ama or toxic deposits in the system. Ayurveda states that about 70% of the toxic elements in the body are discarded through exhalation. Wow! Amazing news right! Just rush to add 2 drops of Mentha oil with 1 drop of Rosemary oil in your burner in the early hours of the day during your Pranayama or the technique of conscious breathing. As it penetrates deeply with its light and subtle qualities, the therapeutic values of Mentha oil pass through the nasal passages in the form of aromatic molecules and reach the limbic system (control center of the brain). You can experience the difference in the texture of skin after regular practice of Pranayama with Mentha magic, as all the microbes and toxic substances are washed out during slow and steady exhalation. 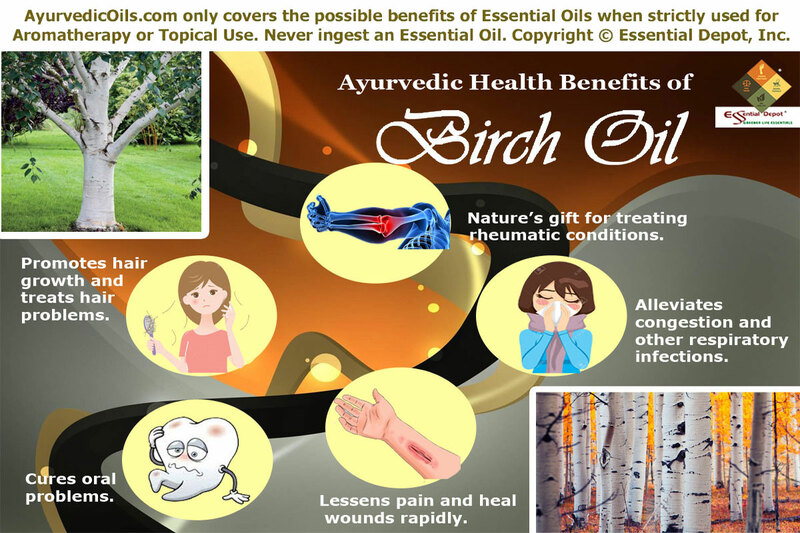 You can also add 2 drops of Mentha oil with 2 drops of Lavender oil and 1 ounce of Jojoba oil and dab externally for treating wounds, pimples, cuts, abrasions, itching, candida and other inflammatory conditions of the skin. Mentha and its mystical essential oil are also used in the treatment of dandruff, wrinkles, cancerous growths, cough, insect bites, impotence, hay fever and more. This article is only for the purpose of education. It is not meant for curing any health condition or for replacing any prescription medicines or advice of medical experts. We are not health professionals and this article focuses on widening the horizons of Ayurveda, the mother of all remedial science on earth. Mentha essential is meant only for topical use. 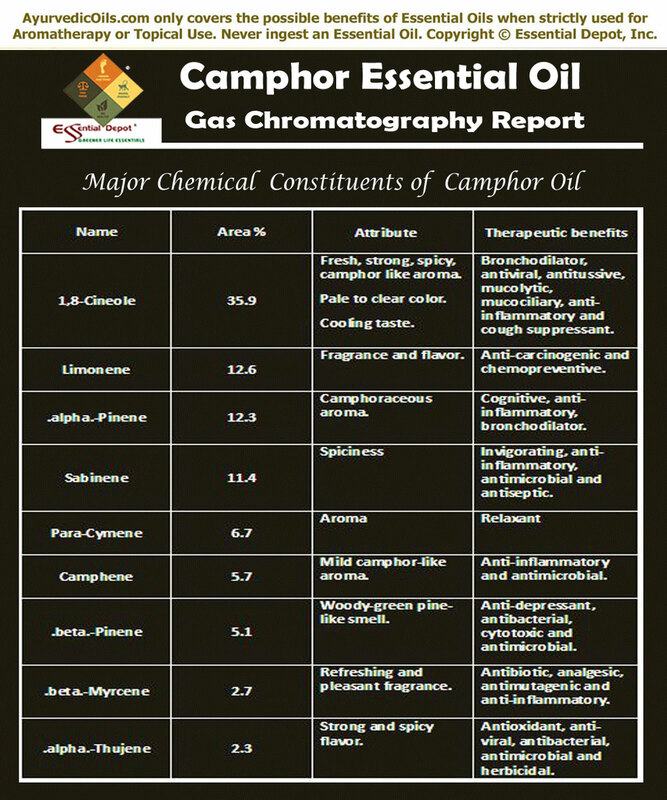 This is due to the fact that pure and organic essential oils are extremely concentrated substances and may cause adverse allergic reactions if used directly on the skin. Do take ingest essential oils. Consult with your Ayurvedic practitioner or healthcare professional before selecting the appropriate essential oils for your individual constitution and health condition. Care should be taken in using essential oils if you are pregnant or nursing. Keep essential oils away from children.